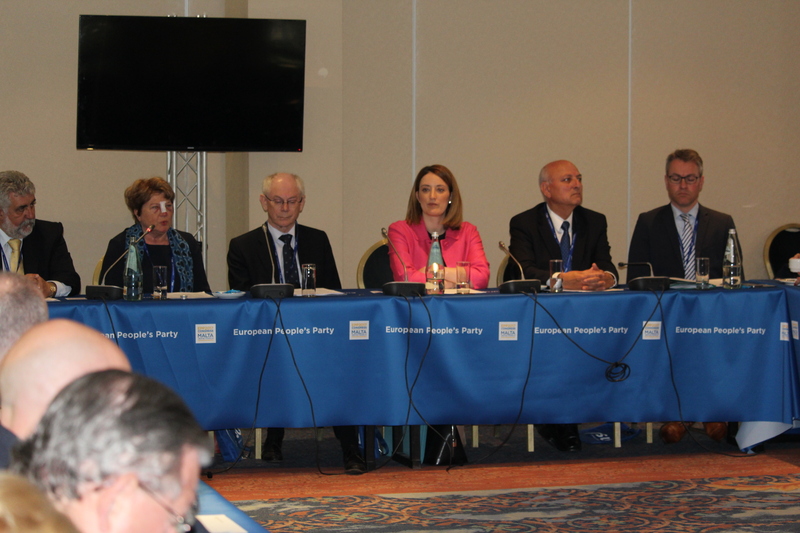 At the occasion of the EPP Congress in Malta, the ESU organized in cooperation with APAN (our Maltese member association), a conference on the “Future of Europe”. The main speakers were Mr. Herman Van Rompuy, former president of the Europe Council, Ms. Roberta Metsola, MEP, and Dr. Louis Galea, former minister and member of the European Court of Auditors. The debate was moderated by Prof. Steven Van Hecke. In addition to the Maltese participants, around 25 participants from other ESU member associations attended the conference. We thank our Maltese colleagues for the organization of this conference, for their enthusiasm, energy and professionalism. In particular we are thankful to Dr. Mario Rizzo Naudi, president of Assocjazzjoni Pensjonanti u Anzjani Nazzjonalisti – APAN, Dr. Louis Galea, Ms. Lina Caruna and Mr. Nazju Abela.